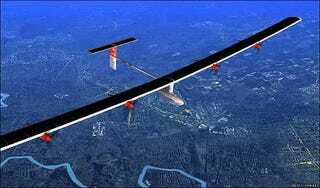 The Solar Impulse is Bertrand Piccard's 100% solar-powered airplane. He plans to go around the world with it in 2011, but the pilots have started training today using an extremely complex virtual simulator that takes into account all its features. It has a 262-feet wingspan full of photovoltaic cells that power its 40kW engines. The Solar Impulse can move its 4,409-pounds carbon-fiber body at an altitude of 39,370-feet, while maintaining a 43.9mph average speed. Full specs and a picture of the team after the jump. With those features, the Solar Impulse won't beat the pants out of the Dreamliners, but it sure is one stunning airplane and one amazing challenge for Bertrand Piccard and his Number One co-pilot, André Borschberg.